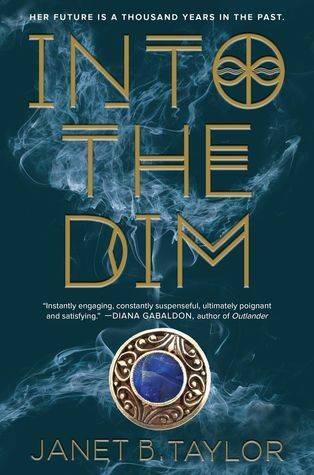 Into the Dim is a novel full of adventure and excitement. 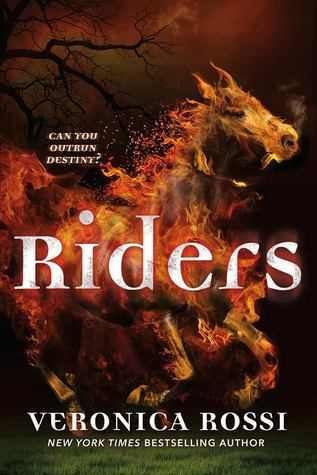 There's the suspense of whether or not Hope and her team can find her mother in twelfth century England, especially when there's another team of people intent on preventing her, and there's the richness of the history and the setting which is wonderfully brought to life by the author, and then the drama and fast-paced plot to keep the reader completely engaged. Not to mention the perfectly pitched romance, which was not overwhelming to the story, and held more than a few surprises for me. As indeed this whole novel is full of fresh twists and unexpected turns. Hope Walton, the main character, is a relatable, normal teen, except that she has a remarkable memory and a surprising family secret. I thought she was the perfect character to take us on this journey, because I found her so empathetic, and it was easy to imagine myself on this adventure with her. She is perhaps not the most stand out character in this book, but I loved how she went from being shy and uncertain to more determined and capable. Although the plot summary doesn't really hint about the villain in the story, there is one, and she's fantastic. The whole backstory was intriguing, and obviously there is more to learn about her. There is real danger for Hope and the other time travelers, and the countdown for them to get back to their own time made everything even more nerve-wracking. Especially because there were a few characters you didn't know if they could trust. The time travel aspect was what initally drew me to read this. And while the publishers tout this as a YA Outlander, it might be just the mechanism of time travel that makes them similar. 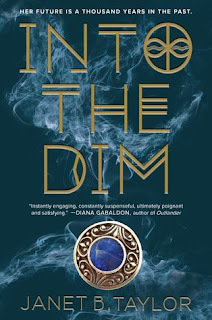 Into the Dim has a lot more of an explanation than just touching a stone though - there's some revisionist history when it comes to famous scientists, and an interesting naturalistic explanation about ley lines and places of power. It makes the time travel seem believable, and the resulting secret society that comes from the discovery lends more realism. I also really liked how the book explains what happens if you try to change the future. It was a lot of information and exposition, but I think it flowed well, and it always supported the action. The romance is another aspect of this novel that attracted me, and I'm happy to say that while it did look to be going down a love triangle path, it turned sharply and became a wonderfully fulfilling romance. There's a real connection (that has an interesting twist near the end!) and a forbidden aspect to it, that made it even more addicting. I loved the romance so much and was very happy with the person! This is a great, fun and fast-paced read, that is historically enlightening, imaginative and completely satisfying. I loved the adventure! A man gets hit by a car - just tapped really, but he looks like he's dead. The Doctor on the scene can't figure it out. But the kindly voice over guy in the episode fills the listener in. The man, Ernest, is a cataleptic, and he carries with him a medical bracelet and a letter explaining his condition, but these things are overlooked. His condition means he might appear dead for 6 hours to 72 hours and he shouldn't be embalmed, nor should an autopsy be performed on him. Will anyone figure out he's not dead before he gets processed at the morgue? A very simple premise - if you can imagine what happens in this story, chances are you are right. It's not a very imaginative episode, other than the idea of being accidentally killed or buried alive because you are mistaken for dead is a nerve-wracking premise. I feel like this episode just took the idea and tried to build a story around it, which wasn't that successful. To me, the only really interesting thing about this episode is the fact that people are so unfamiliar with seeing the words "embalmed", "autopsy" and "cataleptic" that they almost have to sound it out as they read it. And they are not even sure what they mean! Our last week of Discussion Questions are hosted over on Ceres Book World! Check out her post for more information, and for a giveaway of a $15 Amazon gift card! This is the last discussion post. Thank you to everyone who has joined in, it was a pleasure to read Truthwitch with you! And don't forget we have a Truthwitch related twitter chat coming up on Sunday! Lots more fun questions and giveaways planned! Warning: There are spoilers in this discussion post! What do you think of Leopold now that the book is finished? Do you think we will see him again? Oh Leopold. I talked about him a bit in my last Discussion post, but I really do love the characters where you don't quite know what they are doing, but you trust them anyway. And the fact that he pulled one over on Aeduan - just the most threatening witch in the book up til now, makes me supremely happy. Leopold's willingness to sacrifice himself for the cause makes him so noble too. I very much hope to see more of him in the series! What are your thoughts about Iseult and the Puppeteer? What do you think could happen in the next book for them? I mentioned in my post earlier this week that at the book signing for Truthwitch, Susan mentioned there's not really a villain in the series. And I thought the Puppeteer would be the villain. So I'm really not sure what is going on there. I am afraid for Iseult and it's such a mystery why they have a connection - I'm definitely looking forward to finding out more. What do you think of what happened in the end with Kullen, or with Safiya? You know when I first read this book, I really thought Susan wouldn't do this to us with Kullen. But she did. And it's so heartbreaking - with Merik and Rhyber, I just did not want to get to that level of pain and loss. Already in the first book! Seriously afraid for what's in store in the next... I feel like Kullen was always set up in the series to be reckless, so it's not really a surprise that he has the ending he does, but he's such a great character - it's very sad. I'm glad that Safi has more of an awakening by the end about what she needs to do. It was hard for her to have to make that agreement, but I'm sure she will come out on top! Tell me five words to describe Truthwitch? 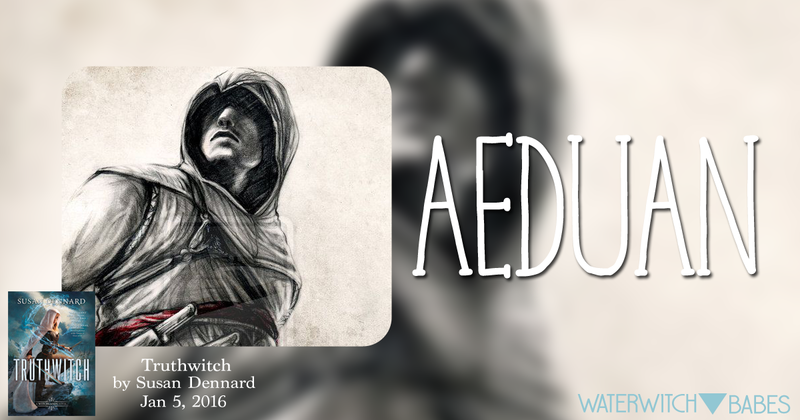 Character Spotlight: Aeduan | What do you think of Aeduan? Do you think he will change his plan now that he knows the truth? “Mhe verujta” means trust me as if my soul were yours. I like this quote. 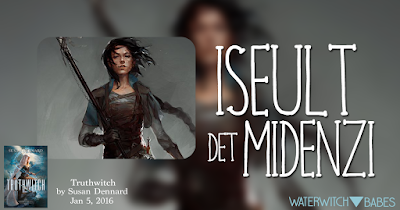 Do you think that Iseult could trust Aeduan? Aeduan was a difficult character for me to like in the beginning, but I loved that by the end, there was a lot more to his character than we initially saw. He's very complex, and his hard views on life makes him an intriguing character to watch change. I think there will be lots more to look forward to with Iseult and Aeduan. By the end of this book, I was convinced that Aeduan could be trusted. :) Mhe verujta is also a wonderful phrase. I love it! Also don't forget that if you haven't done this already, that if you have a second, third, or fourth week Discussion post, you can use one of them for more entries in my giveaway of a Truthwitch design Tote bag! In Movie Musical Challenge, I'm watching 20 films I picked as great films or films I wanted to watch. 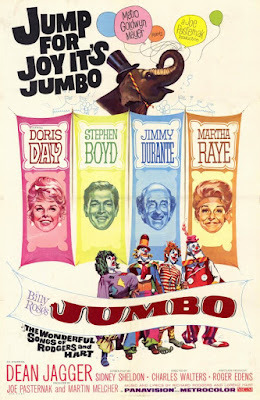 This post is about the 1962 film Billy Rose's Jumbo starring Doris Day, Stephen Boyd and Jimmy Durante. I picked this movie to be a part of my challenge this year on the strength of it starring Doris Day and because one of my favorite songs "My Romance" is from this film. Unfortunately this was not the best film. I won't say this is a bad film - it has a sweet romance at it's heart between Doris Day and Stephen Boyd's characters. The fact that it's called Jumbo makes it seem like it centers around the elephant, which it kinda doesn't, but it was sweet how much love Jumbo got from his circus family. And speaking of the circus, I'm glad I don't have any problems with clowns, because for anyone who might, this could be an issue. Especially with the finale. The problem I had with this movie was how light on plot it is. It's more of a slice of life on a circus - it features quite a few circus act performances, some trials and tribulations facing them, with a thin plot against the Wonder Circus to be taken over by a rival. The story feels very light, and the drama predictable. Doris Day is still wonderful throughout this though, I just love her singing, and she does brightly feminine with a touch of asperity so well. She's fun for me to watch. Stephen Boyd is quite attractive too - I loved his brooding presence in this film, as he has a secret he's keeping. I should talk about the music as well - "My Romance" is still a wonderful song to me - definitely my favorite from a film that was light on musical numbers, although it did feature another catchy tune in "The Most Beautiful Girl in the World." Normally I like to recap things separately (it gives me more posts to schedule and build my buffer!) but individually I probably couldn't talk at length about some of the things I did last weekend, so I'm throwing them all into one post. I'll start with the William Shatner book signing I went to on Thursday which was for his new book on his friendship with Leonard Nimoy. I had a friend visiting me from Northern California, and since we are both Trek fans, it was perfect timing as well. Unfortunately the whole event was run with extremely strict rules. 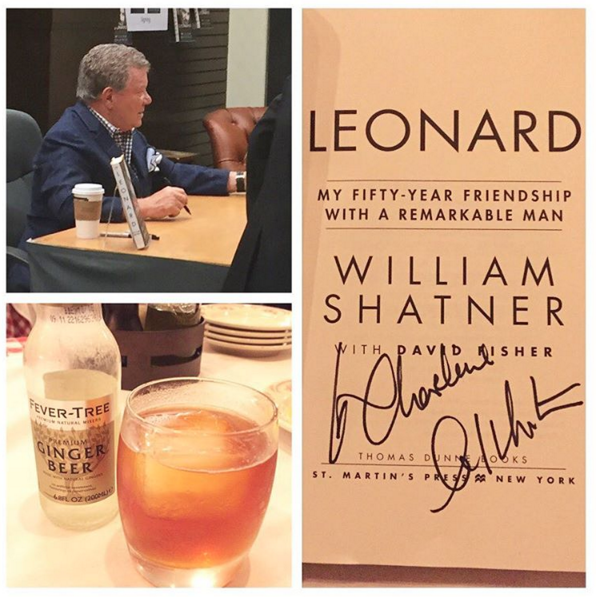 There were no pictures to be taken in line past a certain point - like 10 feet away from William Shatner. Also one book per person (a usual rule for a big celebrity though), and they didn't want us to talk too much to him, because they wanted to keep the line moving. Also there was no talk before the signing like I was hoping, so it was really just get in and get out. William Shatner was gracious though - he acknowledged me and said hi, and when I commented on how much I enjoy following his twitter account, he laughed and seemed about to say something, when the awful person behind me kind of jumped in and started talking to him. So I don't know what he would have said - probably just 'thanks', but my time was up, I had to move along. It was nice to see William Shatner though - still the original Star Trek series is my favorite, so it's meaningful to me to have met him. And I look forward to reading his book! Two sisters, Clara and Adele, have recently lost their mother, and Adele sobbingly makes Clara promise that she will always be there and never leave her. Clara promises, and for many years, as they grow up, they are very close and happy until Clara meets a man named Doug and falls in love. When Adele realizes that Clara wants to marry him, she is furious. Clara promised her she would never leave. Clara begs Adele to understand, but Adele assures her that if she marries Doug, Adele will never speak to her again. Clara does marry him, and has a child, and Adele still refuses to see her sister. A two-hander episode with two female leads is a great thing for Suspense to do. I very much enjoyed this story for the characterization of Adele, who is really creepy, and for how much Clara is willing to take for the sake of her sister. Which is awful for Clara as the episode does begin with Clara in a hospital. On the one hand, it's very predictable what Adele becomes, but on the other hand, it's really disturbing to listen to how it happens to her. And the consequences for Clara. Definitely, this was a great one to listen to! A huge part of the story takes place on the sea. Do you love the ocean? Would you like to travel with the crew on the Jana? Or do you think you'd get seasick? From the boys we've met so far - Merik, Aeduan, Kullen, Leopold - who would you choose to be your book boyfriend? OR: From the girls we've met so far - Safiya, Iseult, Evrane, Ryber - who would you choose to be your book girlfriend? Actually I'm very partial to Leopold! I just love his sense of humor and the fact that he's obviously pretending to be someone he's not. He's much more honorable than he's letting on. At least I hope his character won't take a turn for the worst! Did you imagine the sea foxes as described in the book? Do you think they'll play a greater part later in the series? When I first heard about the sea foxes through the street team project, I really had no idea they would be as menacing and fearsome as they are in this book. They really are pretty monstrous. I loved the suspense they lended to the story, and I hope they will play a greater part later on. Maybe someone will find a way to tame them! What is your first impression of Nubrevna? Nubrevna seems a sad place actually - which makes me hurt for Merik since it's his homeland and it's clear he loves it so much. And Nubrevna was once a great land. It's sad that it's been downtrodden for so long. 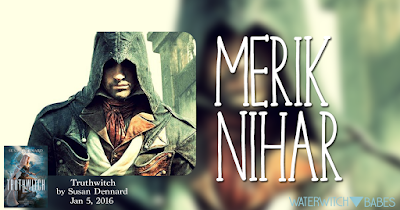 Character Spotlight: Merik | "Whenever there were wrinkles, Merik had to smooth them out." (p. 205) Do you think he succeeds in "smoothing the wrinkles out"? What do you think of his actions so far? Do you like Merik? Merik can be a bit impulsive, but his heart is in the right place, and he is very noble and respected by his people, so I can't help admire him. The strict restraint he has on himself also makes me sympathize with him because he works so hard to do the right thing and not give into his temper. So he tries his best to smooth the wrinkles, and because he works so hard to keep control of himself, I think he succeeds most of the time. He is a fun character to read about though - for all the times he loses control! Also don't forget that if you have done a second or third week Discussion post, you can use one of them for more entries in my giveaway of a Truthwitch design Tote bag! In Movie Musical Challenge, I'm watching 20 films I picked as great films or films I wanted to watch. 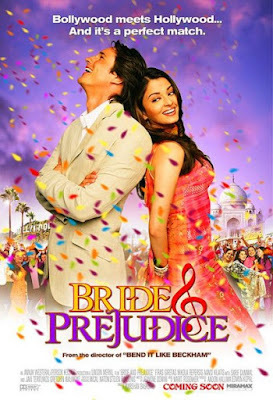 This post is about the 2004 film Bride and Prejudice starring Aishwarya Rai and Martin Henderson. A Bollywood take on Austen's Pride and Prejudice. Fun. This whole movie was just so much fun. I loved how much of the original Pride and Prejudice worked for the changed setting and time, how the music tied in with the emotions, and with the lead actors - they were perfect! Aishwarya as Lalita was brilliant - smart, sharp and beautiful, and Martin as Darcy was a good match for her too - a little clueless, awkward and restrained, but he had a good heart. By the end, it was so sweet for them to finally get together. I loved how well the romance played out in this. The music is wonderful too - I'm not as familiar with the sounds and style of a Bollywood type musical, but the music is very catchy and vibrant. It's a style that appeals to me because it's pop-like, but also unique and interesting. I don't know if I have a favorite song, but I did really like the opening number where the guys and girls at the wedding are dancing and meeting each other for the first time. And this is weird for me, but another highlight of the story was in how spot on they were in casting the "Mr. Collins" or Mr. Kholi. He's just so icky, it's hilarious. Also I really loved how they captured Lalita's parents - also true to Austen's representations of the Bennets, and so funny to watch. The way the film would switch between heightened fantasy song sequences to the plot was a little off-putting, although that seems to be part of the Bollywood style. I suppose it makes the form of a musical interesting because it takes the fact that a musical is a heightened version of reality, and takes it to the next level. All in all though, this was a wonderful film! The premise of this book is very exciting. Four horsemen of the apocalypse, literal possibility of end of the world destruction, and an all important quest. What makes this book really stand out to me, is the way it is framed. Essentially the main battle of the story has already occurred, and the reader is thrust into the story as Gideon must find a way to deal with what happened. The story is told mostly through flashback, and through Gideon's wry, sarcastic viewpoint. I just loved Gideon as a character, and how he processed things. He's gone through a lot, and it shows in how he's developed throughout the story. He's sensitive, flawed, and an honorable, nice guy at heart. Even though he has anger issues. I think he's the perfect narrator for this book, and wonderful to get to know. Another aspect of this book that really appealed to me, was in how, while the reader is learning about everything that led up to the present day with Gideon, Gideon is also processing his surroundings and getting clues about why he's being held by the people interrogating him. The weaving of past and present is beautifully done in the book, and kept me invested in all the action and drama. With the four other main characters, I enjoyed seeing how they came to trust each other and find the best way of working together. 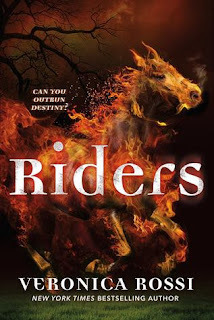 The complexity of needing to show how each of these characters adjust to their circumstances and having to deal with having powers and with demons, must have been difficult to balance just right in the story, but the author pulls it off, and make the whole world feel believable. It's also a fresh kind of fantasy world - at least I'm not familiar with a lot of fiction that deals with horsemen of the apocalypse and demons. So this was a very refreshing and intriguing read! I think the only thing that I didn't love was the romance. I thought it all happened too fast, and it felt jarring for the circumstances, since there was so much going on, and so much at stake. I felt a little impatient with Gideon for being distracted. But the romance is not a major part of the story, thankfully, so it didn't bother me too much. Overall, this was a very exciting read, with a wonderful voice in the protagonist, and an excellent, mysterious fantasy world. The episode starts with Henry Doyle wandering at night by the water and accosted by a woman of the night. He ends up telling her his sad story which goes something like this - Henry has always dreamed of doing many things, and when he was 19, he got a job at a bank as a messenger, intending to move up and become the president some day. Twenty years later, he's still a messenger for the bank - a trusted one, but not what he wanted his life to be. He decides to throw away all his years of exemplary service, to keep the $50,000 he was entrusted to deliver, and go to jail for a few years so he can then spend that money when he gets out. Of course, things don't go according to plan. I thought this was a great episode! At first I thought Henry would do something drastic and stupid to get his "heart's desire", but when 20 years go by, there's a little bit of sadness to the moment when he realizes he's let his childhood dreams go for so long, and he's middle aged now, without getting anything of what he wanted. It made me feel for him, so that his stealing the money wasn't as awful to me. And then the suspense of whether or not he will get that money back made this a great listen. There have been quite a few mottos and words of wisdom used by a few of the characters so far. Which one is your favourite? Do you have any special phrases that help you get through your day? "Stasis in your fingertips and your toes." This is Iseult's reminder to keep herself calm and I love it because control of yourself and your emotions is something everyone has to (or should) master. I've just started trying an introduction to meditation too which is very calming, and I feel like this quote is a mantra for mindfulness technique! I'm thankful that I do have a few people who I would call close friends, who I feel like I can count on. I don't know if they can physically defend me, LOL, but I know that they are loyal and genuinely care for me, as I do for them. It's wonderful to have those kinds of friendships, and wonderful to read about them in fiction as well. Because you can feel more of a connection to the story and characters. For defense, I think the best witchery for me would be being a windwitch. So I can get the heck out of there. LOL I'm not a fighter, and would probably be lacking basic sword technique even in a fictional fantasy world. So it would be defense for me and not offense! 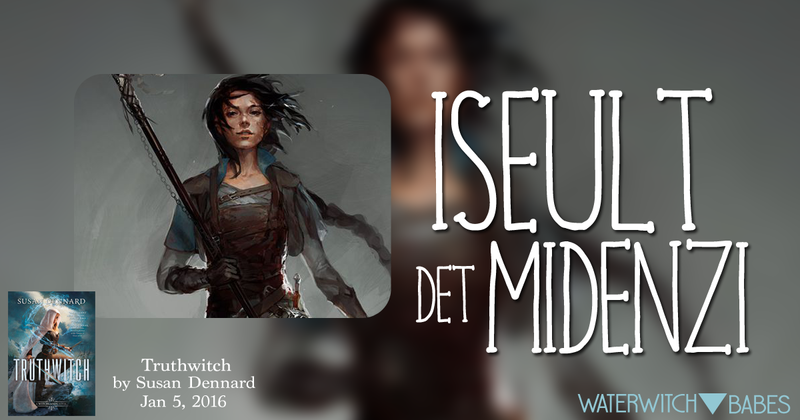 Character Spotlight: Iseult | Do you find Iseult to be a likeable character? How do you feel about the way she is treated like an outcast? Do you think she is a good influence on Safiya? Also don't forget that if you have done a second week Discussion post, you can use it for more entries in my giveaway of a Truthwitch design Tote bag! In Movie Musical Challenge, I'm watching 20 films I picked as great films or films I wanted to watch. 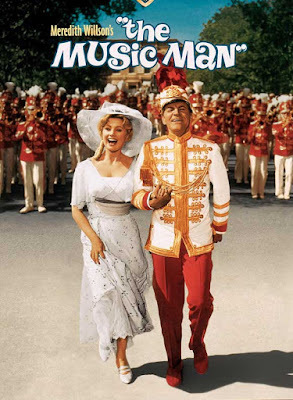 This post is about the 1962 film The Music Man starring Robert Preston and Shirley Jones. And a young, ridiculously still cute Ron Howard! First of all, thank you Quinn! And everyone who said what a wonderful musical this is. You are all completely right - it's marvelous. I can't understand how it didn't make AFI's top 25 list. From the first scene on a train, I was impressed by how the words make the music in this show. It fits because of how words are the main character, Harold Hill's stock in trade. The patter of his songs are just impressive too - I'll already say "Ya Got Trouble" is my favorite song from the show with Harold's persuasive, conversational and completely brilliant warning against the evils of a pool table. The catchy cadence of the words and how the backing vocals of his audience adds to the music of it is genius. Genius is pretty much how I describe this show though - the music and lyrics are exceptional, Robert Preston as Harold is practically dripping charm and assurance and makes his brand of con-man so very attractive. Even though Marian the librarian is a very sensible and intelligent woman, it's completely believable that Harold wins her over in the end! That romance is another exceptional aspect to the musical. Because Marian is 'the sadder and wiser girl', I found her already very appealing, and perfect for Harold who eventually becomes a better person because of her. And Harold also makes Marian a better person too - so it's the best kind of romance. Watching this, I was also struck by how appealing the setting of turn of the century America. I love the music from the time (barbershop quartets are so good!) and the style, and the aesthetic. At least as it has been filtered to me through popular culture. So this movie also appealed to me for that. Even though Harold is a liar and a cheat, there's something about him that makes you want him to get the girl, and be a winner. 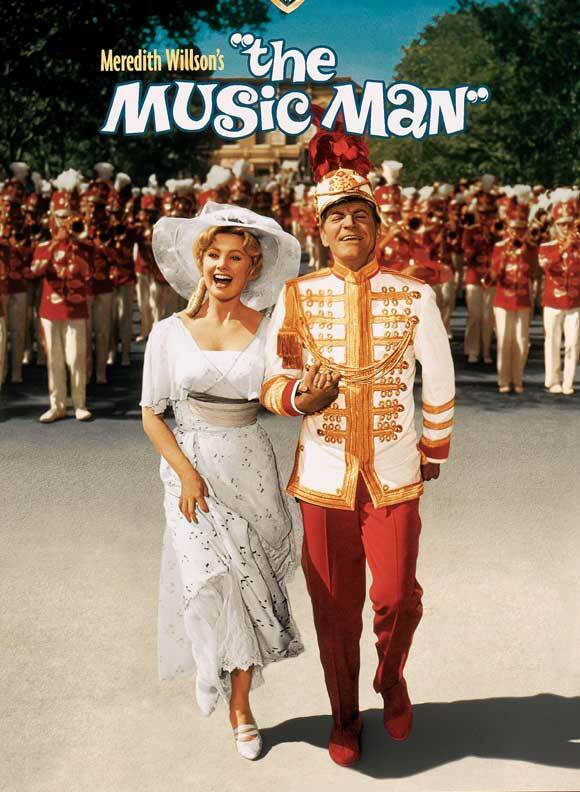 And The Music Man delivers on that, and is imbued with so much joy and wonder and humor that it's absolutely a film everyone should watch! 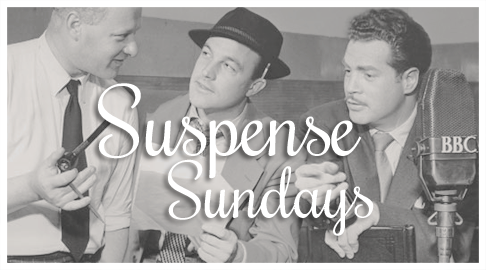 Suspense Sundays (185) Can't We Be Friends? Michael used to date a girl named Fran, When she got sick and in the hospital, he kinda dropped her, and dated around. But months later he still finds himself thinking of her, and decides to see her, now that she's better and out of the hospital. Their reunion takes a left turn pretty quickly as Michael loses his temper and feels very angry that he's still obsessed with her even though they both don't love each other. He's so upset that he decides he has to kill her so he won't think about her anymore. This episode featured a true whack job in the main character. If ever there was a thin reason to murder someone, this would be it. Just get over her! I love that the woman basically said that. I have mixed feelings about this one. It is an interesting story, with a good twist, but I just disliked the selfish and unbelievably callous main character so much, that I very much wanted a swift and just punishment to come to him. But you don't really get that in the end. It is interesting that this was written by the actor who stars in it! 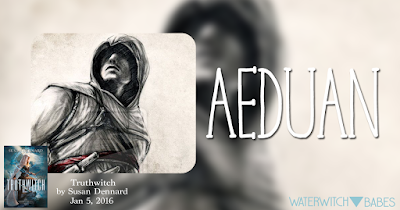 It's the end (or near to the end) of the first week of our Truthwitch read-along. I hope everyone is loving (or re-loving?) the book so far! I'm answering the first week's discussion questions today - if you haven't read it yet, there are some kinda spoilers (although not too bad if you are not a stickler for avoiding them) so fair warning. There's also a giveaway below for a unique Truthwitch design Tote Bag I created especially for this read-along. 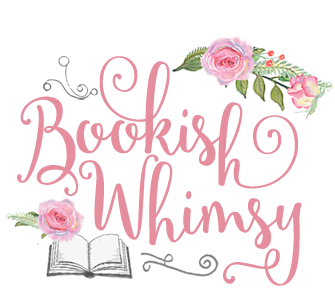 It's open to everyone, not just read-along participants (the giveaway is International!) but the participants in the read-along have the opportunity for more entries. Don't forget that next week the discussion is hosted on Candid Cover! Safi and Iseult are fantastic fighters. Have you ever wanted to learn how to fight, take self-defense classes or have you already? Tell us about your reasoning/experience! I would love to know self-defense - not really how to fight aggressively, but to be able to turn someone's strength against them. Just for the sense of security that would give me I think. And how cool it would be to surprise a potential aggressor with a 'not this time!' moment. :D It's seems fun know how to wield a sword though, but that's probably not for me. If I was going for fantasy fighting skills I would probably go for being adept at the bow and arrow. Of these specialized witcheries revealed so far (truthwitch, threadwitch, bloodwitch, wordwitch, windwitch, voicewitch) which power would you like to have and why? I'm fascinated most with the word witchery. I would love to have the power of words changing people's minds or realities. It's a manipulative power, but because words are so meaningful to me in terms of how I love to read, and delight in expressive and moving prose, it would be interesting to be able to wield that as a power. I'm loving how rich the story is just from the first 9 chapters, and I like every plot point so far (even the political intrigue, which normally doesn't grab my attention), but I think I'd have to choose Safi and Iseult's plight as the most interesting so far. Especially when so many problems come up for them - the Bloodwitch in particular is a nervewracking menace on the horizon for them at the moment. Share a favorite quote from the book! "He might've spent years mastering his family's famous temper, yet all it would take at this point was one more grain. One more grain of salt, and the ocean would flood." This quote about Merik, describes him perfectly - he always seems on the verge of succumbing to his temper. He's fun. :) I love the imagery too, which is so perfect since Merik is the Captain of a ship. Character Spotlight: Safiya | Talk about what you like or dislike about Safi. Do you identify with her in any way? What do you think about her actions so far? Safi is so smart and clever, but I really feel for Iseult in having to deal with her. Safi is also impulsive and prone to rash actions, so I sometimes want to (lovingly?) yell at her for her behavior. It's wonderful how Iseult bears it - truly a sign of how beautiful their friendship is. 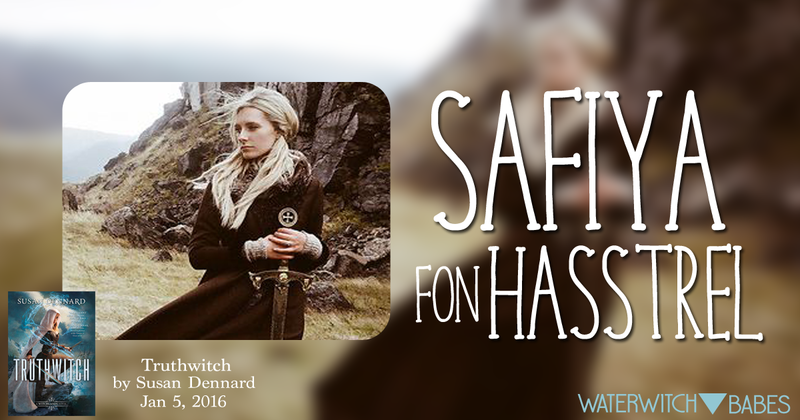 But Safi is intensely loyal and very charming, so she's a wonderful character to get to know - she has her flaws, but she's awesome! The Orphan Queen is a wonderful fantasy adventure. Wilhelmina has so much to overcome, and discover about herself as she struggles to be the queen her people need, and it made for some fantastic character development and drama. Wil was faced with so many perils throughout the story and it kept the suspense and my interest very high. Wil had to deal with the wraith, with trying to get back her kingdom, with the Black Knife, and with some of her friends who might not be completely on her side. There's so much going on with this plot. 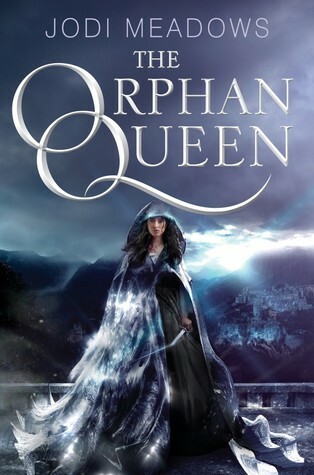 Not only does the book have to show how Wil deals with all of these things, but it also reveals, slowly, what happened to put Wil in the position of the orphan queen. Just the plotting of this book is exceptional. I enjoyed how complex it was, but I was never confused and the pace of the story never waned. Wil is an intriguing protagonist too. She's an exceptional fighter, a clever and talented artist, a compassionate and nurturing mother-figure to the younger members of her band, and she takes her responsibilities very seriously. The strength of her character is impressive, and I also loved that she could be snarky and fun sometimes too. She's an amazing character to get to know. And almost matched by how awesome it was to get to know the vigilante Black Knife. He is an interesting enigma, but so wonderfully admirable, and I loved that Wil grew to appreciate that about him. Their relationship was another great aspect to this story. And as if there wasn't enough to this story, it's also wonderful to have a little mystery about who Black Knife is behind the mask! I absolutely loved diving into the world of this book. There's so much to the plot, the characters and the world-buliding that it was totally engrossing and a vivid and emotional read. Unfortunately it comes with a pretty hefty cliffhanger - one that made me flip pages back and forth, just to make sure I wasn't missing something. Ugh, the anguish! But I'm only so upset over it because I loved the book so much! Safi and Iseult are fantastic fighters. Have you ever wanted to learn how to fight/take self-defense classes or have you already? Tell us about your reasoning/experience! This Friday, February 5th, I'll post my answers to the discussion questions, but feel free to post your discussion at any time! Please do add your discussion post link to the linky below when it's ready. I'll also have a special giveaway of a Truthwitch tote bag, so check back on the 5th to enter! Oh and there's still time to sign-up for the read-along! We would love for everyone to join us! Check out this post for all the details.